Teller County Search and Rescue is an all-volunteer search and rescue team. Our members come together from across Teller County to help anyone in their time of need. We will deliver service that meets or exceeds the requested assistance while ensuring the safety and well-being of our members. You can help support the efforts of Teller County Search and Rescue. We are a registered 501c(3) so all donations are tax deductible. 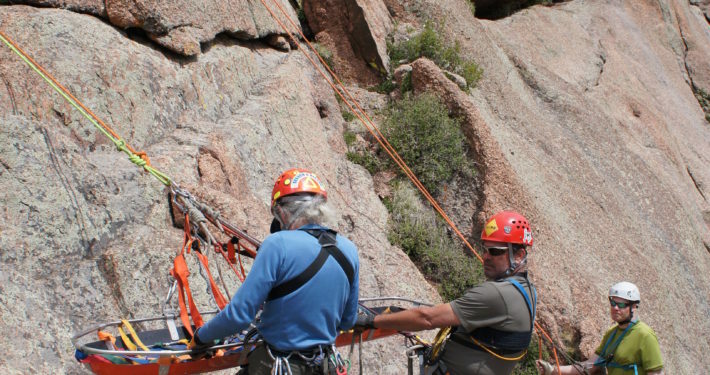 Teller County Search and Rescue (TCSAR) is an all-volunteer, not-for-profit, urban, wilderness and mountain search and rescue team based in Teller County, Colorado. The team operates under the jurisdiction of the Teller County Sheriff’s Office. TCSAR is comprised of over 50 volunteers, devoted to ensuring that the public enjoys their time spent in our County. Members are trained in search, rescue, disaster aid, emergency medicine and wilderness education. Team members get called upon regularly to speak at local functions on various aspects relating to wilderness education. Our mission is “locating and rescuing people in all areas of Teller County and portions of the surrounding area.” This includes El Paso, Douglas, Park and Fremont Counties via agency assistance agreements. The area includes hundreds of square miles of rugged national forest land including a portion of Pike’s Peak. We can, and do, respond elsewhere in the state to assist other search and rescue units. By building strong relationships with these other departments, the result is a mutual assistance environment that benefits Teller County as well as our neighbors.